Many, including myself, would argue that the board games we play are a reflection of our common culture. Monopoly reflects the greed of our capitalist society and Risk oversimplifies our very violent foreign policy. 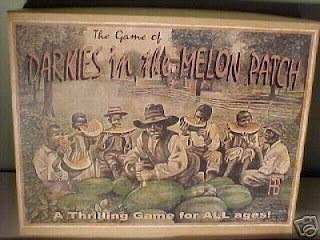 On the subject of slavery and racial subjugation, you should check out this nasty piece of cardboard history. Turns out that this "antique" piece of ugly American history isn't all that antique... Read more here. The review was really cool, and did something (i.e. pointed out that the game was an opportunistic fake) that I've never seen a review do before. As people said there, though, it's a sad thing that racist African American "Americana" like this is such a lucrative business. Yeah, I thought this was just fascinating. And horrible.